It’s the good kind (and the most common kind) of 5th metatarsal fracture. It hurts and my energy level has plummeted (turns out it takes a lot of energy to mend a broken bone, even a tiny fracture), but with giving myself lots of extra time to do anything and resting a ton, life goes on well enough. 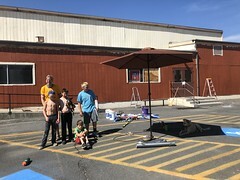 I didn’t realize it was broken at first so I still took the kids and their playdate pal to our local farmers market via bike. Especially that day, and even still now, pedaling is much easier than walking. I sat on my picnic blanket while the kids played (which is what I normally do at farmers market because it’s one of the few things where I can just sit and chill) and was even fine carrying my seven-year old and his bike home. I visited the urgent care three blocks from home (by bike) the following morning. MultiCare Indigo Urgent Care is terrific, though I hope I never have reason to visit them again. They did x-rays on site (I hear the second-closest urgent care doesn’t), wrapped my ankle in an elastic bandage, gave me some crutches, and referred me to an orthopedist a block away with whom I made an appointment for the following week. They thought my insurance wouldn’t cover a medical walking boot so I decided I didn’t need one. Let me just say, crutches are tough! I crutched my way three blocks to school pickup once and it was horrible so I quickly switched to biking. Six days after the break I had to take one kid to a doctor’s appointment in Bellevue and we opted to ride our bikes one mile to a bus stop by campus and leave them locked up there, and then take two buses that would deposit us right across the street from the medical building. The transfer between buses was at a transit center so we didn’t have far to walk (but it was still horrible). However, once in Bellevue we had to walk half a block to a street crossing and then through one building and a parking garage to reach the proper building. That was pretty awful. I was completely worn out by the time we got home. The stress of not being able to make it across any street during the course of a green light with a kid at my side probably added to my end-of-day exhaustion. Fortunately I had my orthopedist appointment the following day and got my boot. It remains to be seen if my insurance will pay for it, but it has made life so much better! The swelling and pain had already decreased quite a bit over the course of a week so I’m trying to convince myself I didn’t inconvenience myself too much by waiting on the boot. And I got “credit for time served” before the boot and only need to wear it for three weeks. Then I’m in a stiff-soled shoe for two weeks and then I’m good as new! True to frugal form, I opted not to get an Evenup, but mostly because I thought it would be a bad match for my klutziness. It seems like a very cool product, though, and if you’re going to be doing more walking than pedaling, you’ll probably want one when you break your 5th metatarsal. I kept the crutches with me for a couple days just to be safe, but I got the hang of the boot pretty quickly. 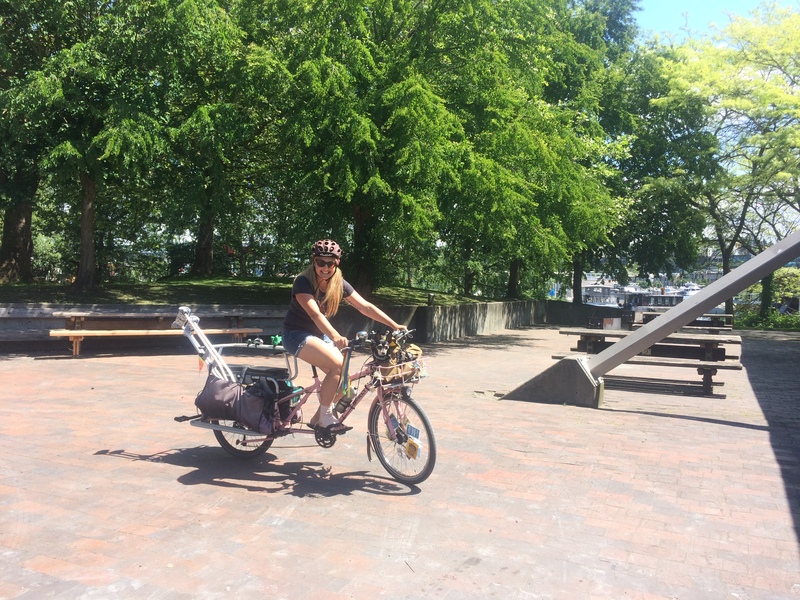 I have fairly big pedals on my Big Dummy–MKS Grip Kings–and while it took a couple days to get used to pedaling with the boot, my foot only slipped off twice while getting used to it–and it wasn’t a painful slip. I’ve accidentally taken a few painful steps while walking, but the pedaling is really A-OK.
It’s much easier to walk with the boot and no crutches and I’ve been walking to school pickup more than biking–that way Pixie gets a little walk and I don’t have to deal with the many cars also trying to pick up kids. The kids have been walking themselves every morning which has been great! While it takes a lot less energy to walk with the boot than it does with crutches, it’s still quite tiring. 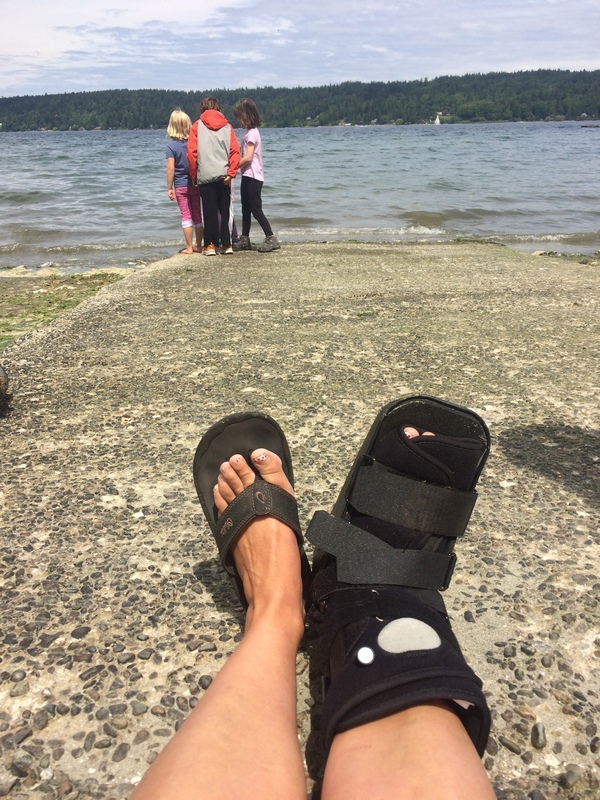 My friend Jen told me about a saying hikers have: “a pound on your feet equals five pounds on your back.” Heaving the boot around is a bit of a task, plus there’s still that whole energy-to-heal-a-tiny-broken-bone thing going on. For two weeks I only used my Big Dummy. All the other bikes live up a few stairs in the house or down a bunch of stairs in the basement and I knew I wasn’t up to doing any bike carrying. The Big Dummy was convenient for carrying the crutches back when they were part of my outfit and proved incredibly comfortable to bike while broken. Yeah, it’s an 80-pound bike, but it’s geared for carrying a lot so moving even slower than my usual slow pace works beautifully. Heh, fun side note: my urgent care visit was during May/Bike Month during which I had the Ride Report app on my phone for automatically logging any bike trips. I biked there so slowly the app must have thought I was walking and didn’t acknowledge the trip. 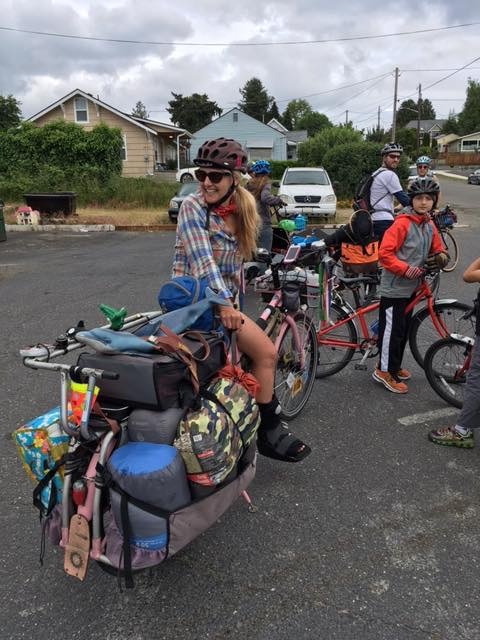 I was even able to lead our Kidical Mass Bike Travel Weekend camping trip. I was very worried about the multiple stops to rest on hills and having trouble getting started, but it wasn’t a problem at all. It all went better than I thought it would and I had plenty of energy Saturday evening…I thought I’d need to go to sleep at 7pm, even before the kids! Granted, once we were home I was a tired wreck Sunday night and all day and night Monday. Two weeks post-fracture we needed to go to Issaquah (20 miles away) for an orthodontist appointment. 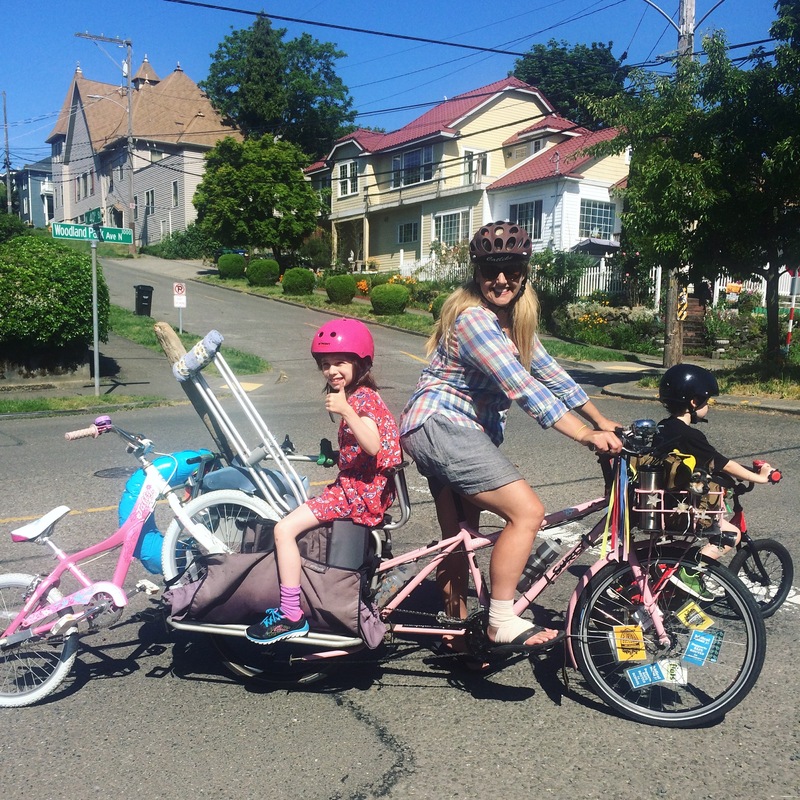 We normally bus and bike to get there and I usually carry one kid on the old mamabike while one rides his own bike, but I didn’t feel up for carrying a kid unless it was on the Big Dummy. The Big Dummy doesn’t fit on the bus, though. So I decided we’d do what we’ll need to eventually do when the kids outgrow the Bobike Junior seat on the old mamabike: two kids on their own bikes and me on a folding bike. Most Seattle buses have three bike slots on their racks, but I worry about encountering a bus that already has a bike on it…as well as worry at taking up all three slots making a regular commuter have to wait for the next bus. And this appointment was for 5pm so there would definitely be a lot of people on the bus. Toting the folding bike around wasn’t too bad. It would have been hard a week earlier when my foot was less healed. Appreciating the daily healing progress makes it a lot easier to cope with what I can do and not focus too much on how hard and painful everything is. The bus was packed and I stood with the bike for a bit while the kids shared a seat. This was probably the first time they’ve shared anything well in years ;) So many silver linings to this fracture! We took two buses there and then biked a mile. The folding bike’s pedals are smaller than the Grip Kings (MKS makes a removable version of the Grip Kings that a lot of people put on their Bromptons, but I have the regular pedals) so it wasn’t quite as comfortable and I couldn’t get the saddle just right so it felt the same as the Big Dummy. I’m pretty sure the two bikes have the same length cranks, but it felt like my foot was moving around more so I figure it had to do with my saddle height. While it felt like I was getting some motion in my foot, it wasn’t more than that caused by walking with the boot so it was just a bit uncomfortable and required extra rest afterwards, no harm done. 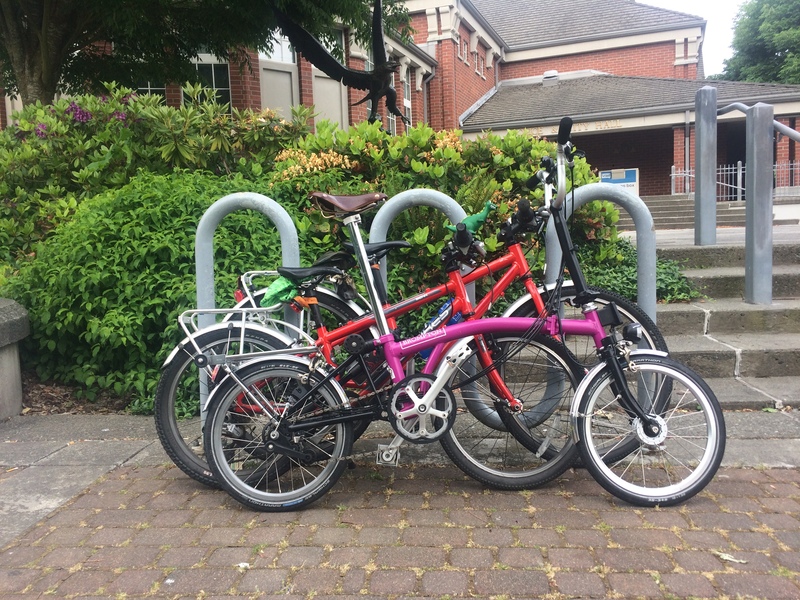 We didn’t see any other bikes on the way out, nor on our first bus home, but I was still a bit worried about not fitting on the rack so we skipped the second bus and biked home five miles from downtown Seattle. OK, OK, I also wanted to tire out the kids so they’d go to bed easily since this had been a pretty big day for me with a bike ride to Greenwood earlier in the day while the kids were at school. So the Big Dummy is by far my favorite bike to ride with a broken foot and the Brompton is OK in a pinch, with its nice low top tube even if the pedals are smallish. But I had plans to visit Portland with Pixie this past weekend and I’m not practiced enough carrying a lot of stuff with the Brompton (it’s new!) so I took my usual travel bike, the Surly Straggler. I wish I had thought to swap for the Big Dummy’s pedals because the Shimano PD-A530 pedals that are clipless on one side and flat on the other are small–and not easy to turn over with a boot on one’s foot. My booted foot slipped off once, but it wasn’t too bad. I was more worried about having to lift my heavy foot over the high top tube, but having gotten pretty used to taking my time for everything lately, this was also an unhurried affair and I didn’t get hung up on the top tube or panniers even once! This trip was more exhausting than the camping trip, though, and I wasn’t while it was super exciting to be in Portland during Pedalpalooza for the first time ever, I couldn’t manage doing much. But I hit Saturday’s Clever Cycles’ 10th anniversary party (but skipped the preceding ride) and attended Sunday’s Cargo Bike Roll Call ride. It was totally OK that I attended without a cargo bike, by the way. 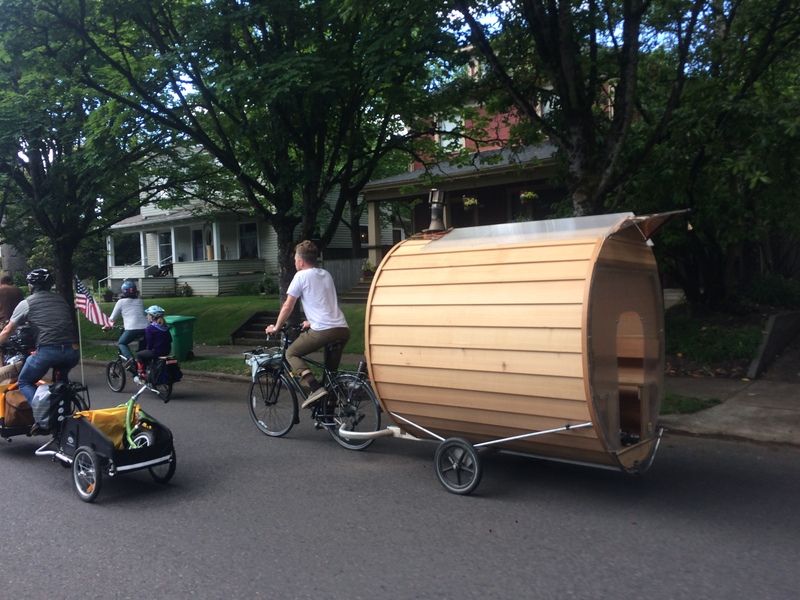 There were a lot of cool bikes, but the sauna trailer was my favorite. Life with a broken foot is certainly not as fun as life with a fully-working foot, but it’s really not that bad. It certainly helps that most things we do are nearby and that the kids are at an age where they’re usually riding their own bikes. Needing to manipulate a big bike with 120 pounds of kids on board would be extremely hard right now. The kids are being great about becoming more independent and helpful. Before the boot, I needed to take them along grocery shopping so they could push the cart while I struggled along behind them on my crutches. Normally that would have been a huge pain, because normally there’s nothing more enticing than fighting over pushing a grocery cart with one’s brother, but they held it together for our two whole-family shopping trips. 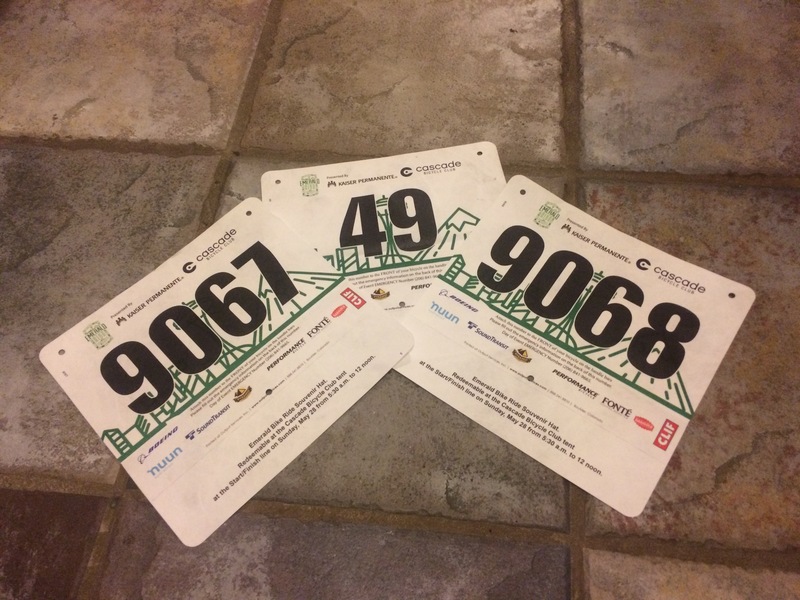 In being careful about not overdoing it, I had to skip the Emerald Bike Ride over Memorial Day Weekend. We managed an abridged version (just as much for the kids’ sake than mine!) of the Mighty-O Tour de Donut on Saturday, though! I even carried a kid and a bike for an uphill portion…but a kid lighter than my own. Note my awesome low number! That’s because I can trade Cascade Bicycle Club ride leader credits (I lead my most of my Seattle Critical Lass rides as a Cascade ride leader) for rides. Note: there’s a ride leader certification class on June 19th if you want to join the ranks. So step carefully, friends, but if you falter it’s not the end of the world. You are amazing. Even if you didn’t have a broken foot.